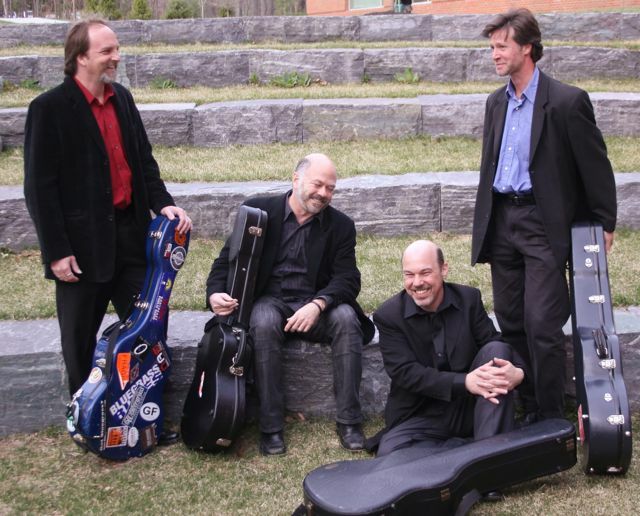 The Finger Lakes Guitar Quartet is the union of four veteran guitar soloists and chamber musicians, Joel Brown, Sten Isachsen, Brett Grigsby and Paul Quigley. FLGQ performs a repertoire that spans several centuries and includes music written for and premiered by them. They have performed for the Cleveland Classical Guitar Society, Great Lakes Guitar Society, Hudson Valley Community College Guitar Festival, Upstate New York Classical Guitar Society, and in many other venues. Joel Brown is a versatile guitarist whose performances include Carnegie Hall, Lincoln Center, the Guitar Foundation of America’s Convention in Miami, and the Monterey Jazz Festival. He is a Distinguished Artist in Residence at Skidmore College. Sten Isachsen is a multi-instrumentalist who is equally at home in the bluegrass world as he is in the classical music world. He is a full time member of the music faculty at Schenectady County Community College. Brett Grigsby has performed as both soloist and chamber musician at New York’s 92nd St Y, St. Patrick’s Cathedral, St. Paul’s Chapel, and in an all Bach program at the prestigious Steinway Hall. He is currently on the music faculty at Skidmore College. Paul Quigley is an active soloist and chamber musician who has performed as a soloist with the Glens Falls Symphony, the College of Saint Rose Camerata and the SUNY Albany Orchestra. He is on the faculty of Schenectady County Community College, The College of Saint Rose and SUNY Adirondack.